Here is a Ninja with a real grudge against plastic bottles. Watch and enjoy. Want to stay warm this winter AND look cool at the same time? 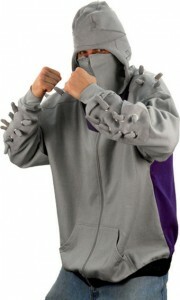 Then you should definitely check out this Ninja Turtles Shredder hoodie! There is no better way to boost your popularity than by wearing this item! You should especially wear this hoodie if you happen to hate turtles and rats. If you dislike being a cool looking ninja-type man though with some mysterious past involving a rat, then you should not wear this item. To successfully make this Ninja Turtles Shredder trend catch on you must speak with an evil voice and show no mercy to those who want mercy! And if they don’t want mercy, then give them mercy — just because you are Shredder and you take orders from nobody, not even yourself!